The Kepler from Naturalizer® keeps you going from day to night in complete comfort and style. Smooth, premium leather uppers with a decorative strap with buckle at ankle and a round toe. Medial zipper closure for an easy on-and-off. Ankle-high silhouette with a lightly padded collar. Soft fabric linings. N5 Contour technology features dual density cushioning on a patented contoured footbed with arch support. All made with lightweight and breathable materials for superior comfort and support. Block heel with a stacked-look. Durable non-slip outsole to offer sure footing as you walk. Imported. Measurements: Heel Height: 1 1⁄2 in Weight: 15 oz Circumference: 11 in Shaft: 5 1⁄2 in Platform Height: 1⁄4 in Product measurements were taken using size 8, width M (B). Please note that measurements may vary by size. Weight of footwear is based on a single item, not a pair. The Kepler from Naturalizer® keeps you going from day to night in complete comfort and style. Smooth, premium leather uppers with a decorative strap with buckle at ankle and a round toe. Medial zipper closure for an easy on-and-off. 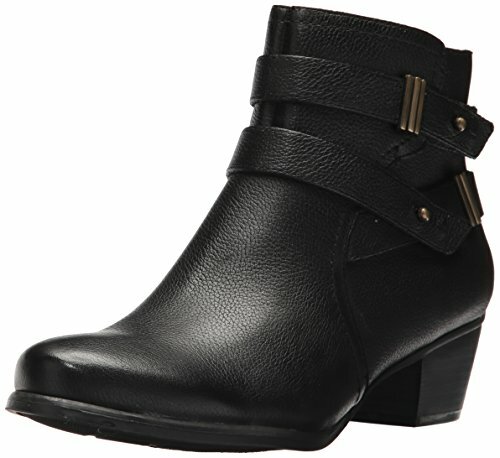 Ankle-high silhouette with a lightly padded collar.